The young Leonie Rysanek triumphs in her second Met broadcast of the almost four dozen she would do during her astonishing career. Here she is Elizabeth of Valois, married to King Philip II of Spain (Jerome Hines), even though she loves his son, Don Carlo (Giulio Gari). Rysanek’s heartbreaking performance fully connects with Elizabeth’s passion and despair. Beloved baritone Robert Merrill is Don Carlo’s friend, Roderigo, killed by the Inquisition. 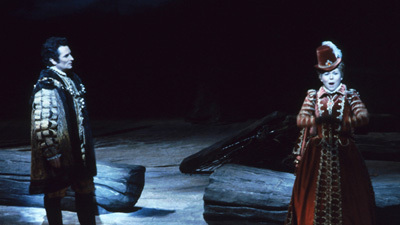 Blanche Thebom is Princess Eboli and future superstar Martina Arroyo is heard in her Met debut role as the Celestial Voice.